Enzo provides over 40 years of experience in the manufacturing and supply of research kits, biochemicals, and biologicals. As Scientists Enabling Scientists, we realize the value in providing relevant information to our customers working in the fields of life sciences, drug development and clinical research. We are happy to provide simple yet useful tips and guidance for your research needs. Immunohistochemistry (IHC) is a widely used technique allowing the end user not only to analyze the anatomy of the tissue of interest but also to visualize the expression, the localization, and the intensity of a specific antigen on a tissue section. 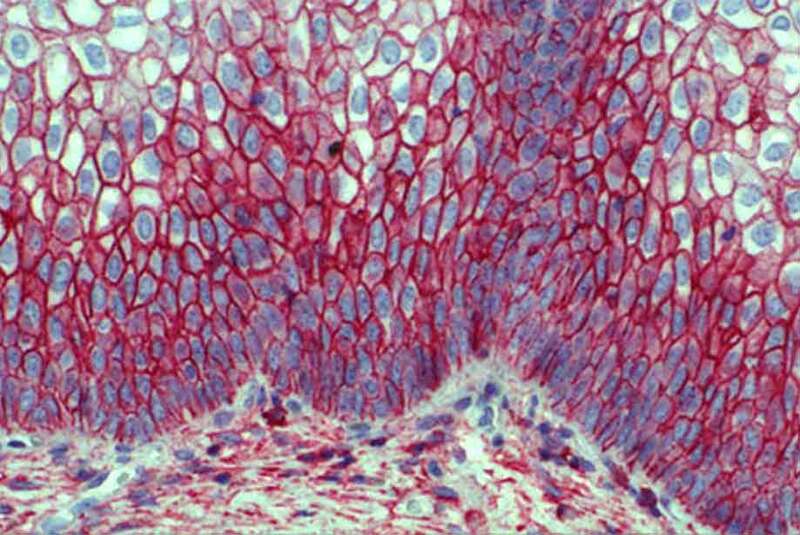 Although IHC is a relatively easy and straightforward technique, the quality of the staining may be influenced by several variables. With this in mind, we have compiled a troubleshooting guide to help achieve high quality IHC data. Confirm the expression of your protein of interest by in situ hybridization or RT-PCR. Note that expression at the mRNA level does not automatically mean expression at the protein level. Use a tissue type known to express your antigen of interest as a positive control. Fix tissue promptly to prevent antigen diffusion. Use a different fixative (e.g. cross-linking fixative instead of organic fixative) if fixation is not adapted for the antigen of interest or increase incubation time with fixative. Decrease fixation time if the antigen epitope is altered or modified. Determine the appropriate antigen retrieval method, either heat-induced or enzymatic-based, to unmask the epitope of your antigen of interest and reestablish immunoreactivity. Always use fresh xylene for deparaffinization and if necessary, leave the tissue sections a bit longer in xylene (e.g. 4 times for 2 minutes). Supplement your blocking buffer and your antibody dilution buffer with a potent permeabilization reagent such as Triton X-100. Decrease blocking time or reduce quantity of serum in blocking buffer in order to prevent antigen masking. Note that serum may contain neutralizing antibodies. To avoid contamination and freeze-thaw of your antibody, aliquot the antibody into low-protein-binding-microcentrifuge tubes based on typical experimental usage (no smaller than 10µl) and freeze at -20°C or -80°C based on storage guidelines for your product. Confirm the suitability of your antibody for IHC and whether it is compatible with FFPE and/or fresh frozen tissue sections. Your antibody needs to be able to detect your antigen of interest in a native form. Perform a non-denatured Western blot experiment for confirmation if necessary. Use the appropriate antibody diluent and ensure that its pH is within the optimum range for binding (i.e. pH 7.0-8.2). Increase incubation time (e.g. overnight at 4°C) and/or use more concentrated solution. Antibody titration should be envisaged. Use a secondary antibody generated against the species in which the primary was generated and ensure that the isotypes are indeed compatible. Replace the diluent in case of the presence of neutralizing antibodies in your serum. Increase incubation time and/or use more concentrated solution. Antibody titration should be envisaged. Use a more sensitive detection system such as a polymer-based detection system to significantly augment sensitivity and signal intensity (e.g. Enzo’s POLYVIEW PLUS IHC reagents and kits). Prepare enzyme complex following manufacturer’s recommendations. Replace PBS with TBS when using alkaline phosphatase (AP)-based detection systems. Do not use sodium azide either as it will inhibit horseradish peroxidase (HRP) activity. Check whether dehydration is required and use the appropriate counterstain and mounting medium as some chromogens can be soluble in organic solvents such as ethanol or xylene. Use aqueous mounting medium as an alternative. Perform quenching of endogenous peroxidase after incubation with the primary antibody rather than before. Assess enzyme-substrate reactivity independently to make sure the reagents are still functional. Maintain the integrity of the tissue at all times. Ensure your tissue sections are not torn or folded, and that they do not have bubbles trapped underneath. Use freshly prepared slides whenever possible and prepare thinner tissue sections if necessary to facilitate penetration of the reagents. Ensure your tissue sections remain wet at all times. Choose the right fixative and optimize fixation (e.g. incubation time, pH, and temperature) as fixation is considered to be tissue-specific. Determine empirically which antigen retrieval conditions are required to maintain the immunoreactivity of your antigen of interest. Use Tween-20 instead of Triton X-100 to permeabilize your tissue in order to maintain membrane integrity. Use normal serum from the same species of the secondary antibody preferentially prior to incubation with primary antibody. If necessary, increase serum concentration. Alternatively, use a universal blocking solution such as Enzo’s Antibody blocker/diluent. Increase the blocking incubation period. Omit washing and simply drain the blocking buffer before incubating with the primary antibody. Reduce the concentration of the primary antibody or alternatively, use a different primary antibody. Using a monoclonal antibody instead of a polyclonal will reduce cross- reactivity. Reduce the concentration of the secondary antibody or use one that has been pre-adsorbed against the Ig of the species of your samples. Use a polymer-based detection system such as Enzo’s POLYVIEW PLUS IHC reagents and kits instead of a biotin one to increase specificity. Incubate at 4°C for a slow but specific binding of your antibody to the antigen of interest expressed in your tissue. Add 0.15M-0.6M NaCl to the diluent buffer in order to increase ionic strength. Quench endogenous enzymes with 2mM Levamisol for alkaline phosphatase and/or 0.3%-3% (v/v) H2O2 for peroxidase. Wash tissue extensively with PBS to remove any traces of fixative. Replace PBS with TBS when using AP-based detection systems. Lower salt concentrations in the diluent buffer to diminish ionic interactions, especially when using monoclonal antibodies. Our high sensitivity, low background reagents combined with the market’s most extensive palette of unique chromogens and a broad catalog of IHC-validated antibodies provide the flexibility needed for simple or complex protocol (e.g. one-color or four-color IHC staining, respectively). Enzo offers a complete set of tools to help improve the quality and efficiency of your IHC process from antigen retrieval to mounting. Products that have been recently launched are detailed below. Please check out our IHC platform for more information or contact our Technical Support Team for further assistance. Check out our 10 Tips for Successful Immunohistochemistry!